Lifetime Achievement Award | Florida Hikes! 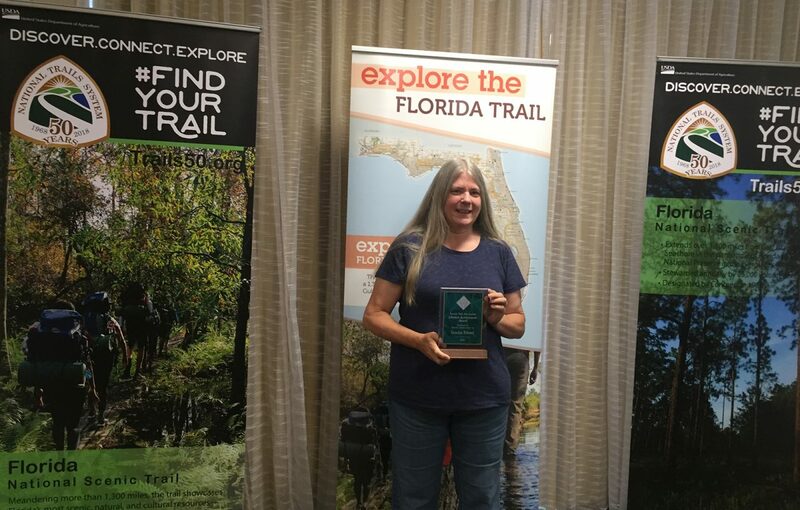 At the Florida Trail Association (FTA) Annual Meeting on April 7, 2018 in Gainesville, Florida, longtime FTA volunteer, author, and trail expert Sandra Friend was honored with a Lifetime Achievement Award. Established in 2005, it is one of three major awards granted Florida Trail Association volunteers for their outstanding contributions to the Association and to the Florida Trail. Joining the Florida Trail Association after moving back home to Florida after the loss of her younger sister in 1999, Sandra immediately volunteered her skills to build and maintain websites and produce newsletters and other publications. Her nonprofit background included trail maintenance for the Keystone Trails Association; desktop publishing for a variety of nonprofits including WQED Pittsburgh; and website, newsletter, and Companion Guide research for the Appalachian Long Distance Hikers Association. While living in Pennsylvania, she’d started backpacking and established her outdoor writing career through articles for the Pittsburgh Tribune-Review, Pittsburgh Post-Gazette, and numerous regional magazines. In 1999 and 2000, Sandra worked with legendary trail maintainer Kenneth Smith on the development of the Florida Trail along the Cross Florida Greenway, participating in the ribbon-cutting of the Land Bridge over Interstate 75 as well as becoming a regular at public meetings about the Greenway. While living in the Orlando area for a couple of years, she helped the FTA Central Florida Chapter develop a regional trail guide used for fundraising, and started work on the 50 Hikes series to Florida. She also served on trail maintenance crews and became certified as an FTA Activity Leader so she could lead public hikes. She was one of the first three people to complete a hike of the newly opened Western Corridor of the Florida Trail in 2001, writing articles about the experience for the organization’s newsletter. It was during this hike that, prompted by data-gathering to support Nimblewill Nomad in his effort to hike this new section southbound, she began keeping detailed trail descriptions, photos, and mileage for hiking in Florida. She was also one of the first two people to hike the full “Big 360” circle that the Florida Trail made around Central Florida. Moving back to the Ocala area to focus on guidebook research, Sandra maintained the Florida Trail’s Pruitt section along the Cross Florida Greenway for four years. While working on this section, she and Kenneth were asked to design the Holly Hammock Hiking Trail for Ross Prairie State Forest; the trail still follows this same route today. While actively hiking portions of the Florida Trail statewide, she served in several volunteer roles with the FTA Florida Crackers Chapter (now Sandhill Chapter) during this time period, including as activity leader and newsletter editor. In 2002, Sandra wrote the first mass-market guidebook to the Florida Trail, the Florida Trail: The Official Hiking Guide, and followed it up by collaboration with photographer Bart Smith on the first coffee table book written about the Florida Trail, The Florida Trail. Starting with long distance hiker information originally crafted by the only female FTA Vice President of Trails, Joan Hobson, Sandra added her own trail research and produced a series of Florida Trail Companion Guides for the Florida Trail Association over the next five years, following the format of the famed ALDHA Thru-Hikers Companion Guide to the Appalachian Trail. In 2003, Sandra was awarded the prestigious Cornelia Burge Award, the highest honor FTA service award at the time, for raising the bar on what was a membership newsletter by developing the organization’s first full-color membership magazine, the Florida Trail Footprint. Later that year, she was hired by FTA as their first and only Communications Director, spending the next five years focused on media and public outreach, member and public communications, and connecting the volunteer and tourism communities. During her tenure, she substantially revamped the existing website, developed the concept and found funding for the well-attended Florida Hiking Festival held in White Springs in 2008, and served on a variety of external committees, including with VISIT FLORIDA, to expand knowledge of the trail to new markets. She received a major National Forest Service award for building volunteerism through blogging, as well as regional and national awards for the organization’s website and publications. Returning to full-time freelancing a decade ago, Sandra continued to promote the trail through the website she had founded in 2006, FloridaHikes.com, and through magazine articles and public speaking. Rejoining the FTA Central Florida Chapter, she began to lead hikes again. In 2013, with the encouragement and collaboration of her now-husband John Keatley, she launched a new guidebook for the 1,400-mile trail, The Florida Trail Guide. Now in its third edition, it is also available as a more frequently updated geolocated app for iPhone and Android in partnership with Atlas Guides. The growing number of long distance hikers that these products attracted to Florida – and the related need for hiker support – led John to found the Florida Trail Hikers Alliance, a nonprofit focused on the hiking experience. Sandra serves as its volunteer Executive Director. Drawing on many years of subject interviews and Sandra’s vast knowledge of the trail, Sandra and John developed a 50-year history of the Florida Trail as a limited edition commemorative coffee table book, The Florida Trail: Florida’s National Scenic Trail. In conjunction with the book’s debut in 2016, they launched a new website, The Florida Trail, to make it easier for hikers to find critical trail information online. They are presently working on Florida Trail Hikes, a book of the top scenic day hikes and overnight hikes along the length of the 1,400-mile National Scenic Trail, to be released this year. So very well-deserved. Happy for you! Congratulations, Sandra! Thank you for all you have done for the FTA and Florida Trail over the years! I am sure the trail wouldn’t be where it is today without you!